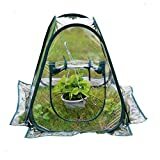 The cool new Pop-Up Tomato Accelerator is a protective miniature greenhouse that lets you get an early start growing your tomatoes, peppers, and other heat-loving plants, plus get an earlier harvest. Just pop it open, place it over your tomato transplant, anchor it to the soil using the loops on the base, and enjoy some peace-of-mind knowing the tomato plant will be protected from cold temperatures and wind. It features a zippered mesh top that prevents overheating, lets water through, and opens for better ventilation and flattens for space-saving off-season storage. Great gardening solution. Dalen 100055848 Gardeneer Season Starter, 18 In. x 17 In.